Important ideas are born in these 8-by-11-foot enclaves, which now can be named in honor of beloved professors. Over the course of the past six months, the process of endowing three of the studies has begun. When Beth Anderson '80 thinks about all the professors she had at Cornell, one stands out above all others: Fred Marcham, Ph.D. '26, the Goldwin Smith Professor of History, university trustee and boxing coach. "He had more influence on me than any other," Anderson says. "Besides history and literature, he taught me about listening for the birds, observing trees closely and also a good deal about kindness." He also taught her about the "essential nature of libraries," Anderson adds, so the library seemed like the right place to honor him. She and her mother – Arlie Williamson Anderson '47, who died last October – named a faculty study on the seventh floor of Olin Library for Marcham, who taught them both. Just down the hall, another study will honor another favorite professor: Michael Kammen, the Newton C. Farr Professor of American History and Culture, who died in 2013. 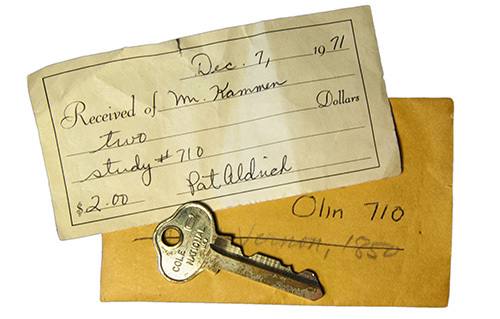 Kammen researched a series of seminal books, including his 1972 Pulitzer Prize-winner, in the library and his study, Olin 710. Historian Carol Kammen calls her husband's study "his home in the library; where he kept his hat and coat, where he compiled a collection of books that interested him, that might contain something he needed to know, or something he wondered about. It was his base." To honor Michael Kammen's memory and legacy, his former students, colleagues and family members have committed to naming the study, which cost $15,000. 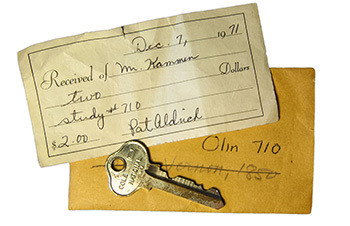 "I distinctly remember Professor Kammen explaining at length how important the library was in making his decision to come to Cornell," says Michael Sillerman '68. "In a sense, then, Cornell and its students and faculty have the library to thank for Professor Kammen's many years of wide-ranging and uniquely insightful contributions to the campus and historical scholarship." The newly endowed faculty studies are bringing renewed attention to their namesakes. The Cornell Association of Professors Emeriti created a space on the library-supported eCommons where people can learn more about Marcham and re-released one of Michael Kammen's books, which has been downloaded more than 4,000 times. And more named studies are on the way. Another alum has stepped up to name a study for Edward W. Fox, an esteemed Cornell professor for 30 years and a renowned historian and diplomat. Endowing these studies honors not only professors of the past but also supports current and future faculty members. 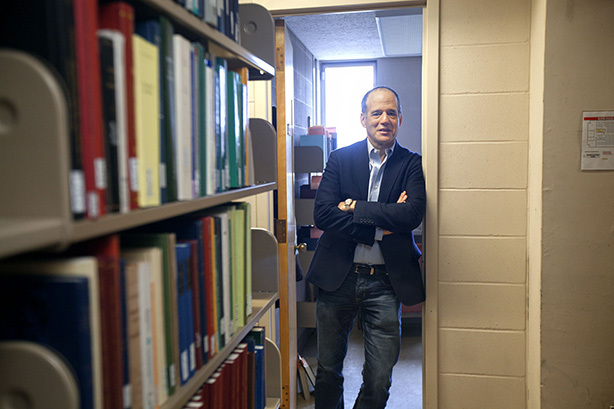 "My research would simply not be possible without the resources of Olin Library," says professor Barry Strauss, chair of the history department. "As for my Olin faculty study, it is the one place where I can go to gather the print materials, which are still crucial, and reflect on them in the solitude that good scholarship needs." Olin has 82 studies, and Kroch Library has 12. To find out about how to honor a favorite professor with a named study, contact Jennifer Sawyer at jds367@cornell.edu or 607-255-9568. This story originally appeared in Ezra magazine.